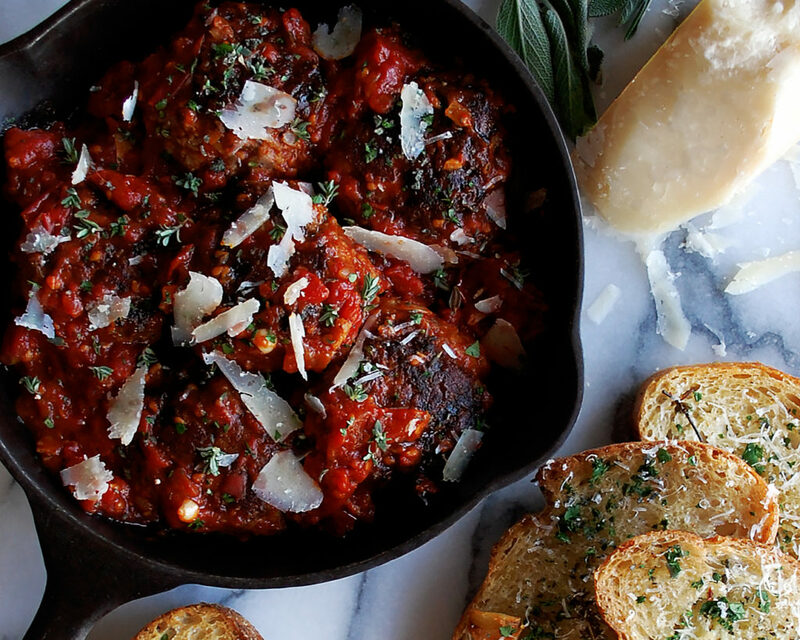 There is nothing like a big plate of classic meatballs on a cold winter night, especially with a side of buttery garlic bread. This is one of those recipes where I didn’t put too much thought into it. 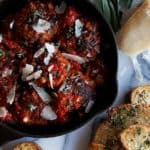 I knew I wanted really simple, classic meatballs…with lots of garlic, a rich meaty flavor, a tomato-based sauce, and some toasty, flavorful bread on the side. When I made these Thai curry meatballs, I was really happy with how the texture of the meatballs turned out. I used fresh bread and soaked it in milk before adding it to the ground beef mixture, unlike most recipes that call for breadcrumbs. The soaked bread keeps the meatballs extra tender and juicy. I used that same technique with these, and they turned out perfectly. The key to a good meatball is searing the outside first until crisp and caramelized. You don’t want them to cook all the way through in the pan, though. Once seared, you’ll transfer them to the oven to finish. 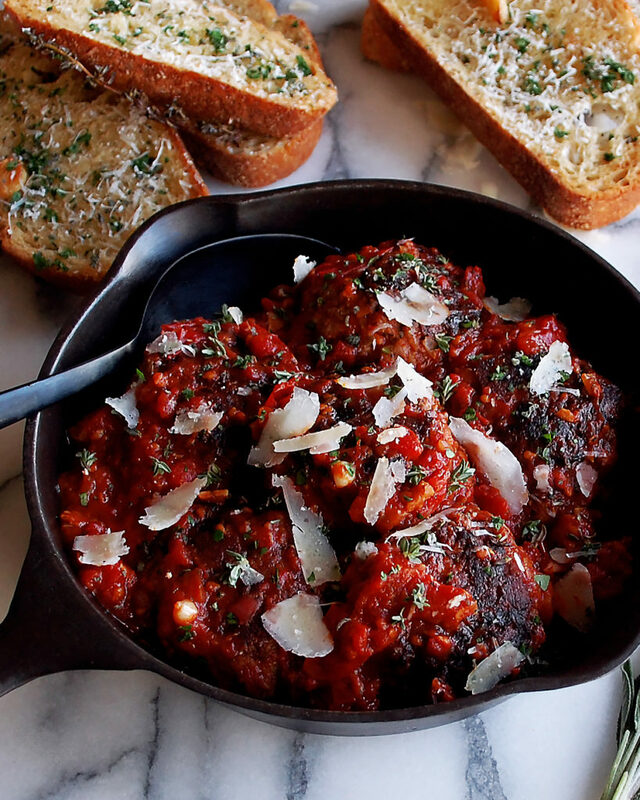 Really flavorful meatballs with an incredible texture. I serve the meatballs with a sweet, caramelized tomato sauce. And with some garlic bread…that is my favorite part. Use it to soak up all the tomato sauce and as a vehicle for bites of meatballs. Also, definitely buy a nice chunk of parmesan cheese to shave over top. It adds the perfect finishing touch. Heat a heavy-bottom pot over medium heat. Add enough olive oil to coat the bottom. Add the shallots and sauté for about 6 minutes until slightly caramelized. Add the garlic and cherry tomatoes. After a few more minutes, stir in the tomato paste. Cook for 2 minutes. Add the whole tomatoes. Use a potato masher to break apart the tomatoes. Add the fresh thyme. Season with salt and freshly cracked black pepper. Bring the sauce to a simmer. Cover the pot and simmer on low for about 45 minutes. Remove the cover. Continue to simmer for 15 more minutes, stirring often. Taste the sauce and add salt if needed. Keep warm. Meanwhile, preheat the oven to 400°F. Heat a large sauté pan over medium heat. Add enough olive oil to coat the bottom of the pan. Add the onions. Saute until caramelized. Stir in the garlic. Turn off the heat and let the mixture cool. Remove the ground beef from the refrigerator and let sit at room temperature for 25 minutes. Place the bread cubes in a large bowl and pour the milk over top. Press down to ensure all of the bread is submerged. Let the bread sit for 20 minutes until slightly softened. Add the ground beef to the bread bowl, along with the onion mixture. Add a pinch of salt. Use your hands to mix well until fully incorporated. Form the mixture into meatballs, about 4 ounces each. Use your hands to form them into round, even balls. Sprinkle each with a bit more salt. Heat a cast-iron skillet over medium-high heat. Coat the bottom of the skillet with safflower oil and let heat. Working in batches, place the meatballs into the pan, spacing them 1” apart. Sear the meatballs on all sides until golden brown and caramelized. Once the meatballs are seared, transfer them to a foil-lined sheet pan. Finish searing the rest of the meatballs. Bake the meatballs for about 10 minutes, or until cooked through. In a small saucepan, add the butter, garlic, sage, and thyme. Let the butter melt over medium heat and come to a bubble. Simmer for 15 minutes on low. 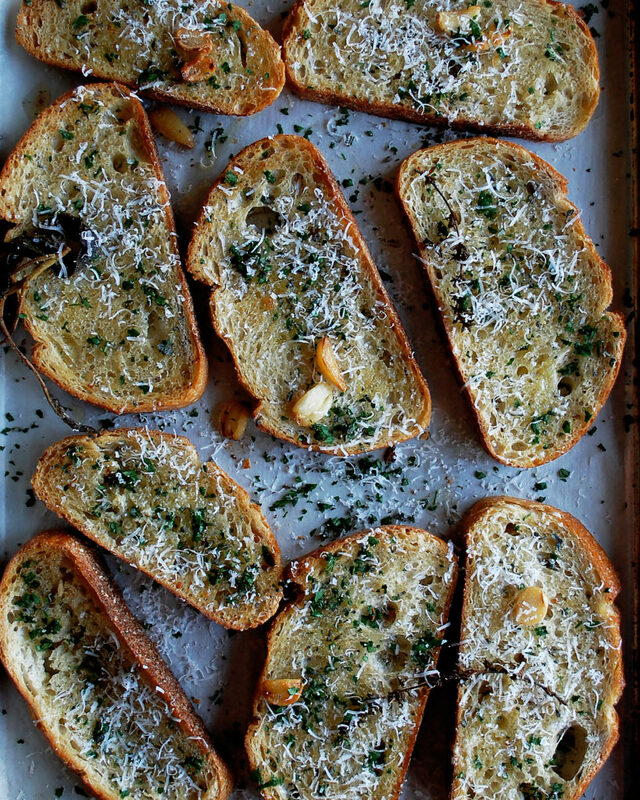 Place the slices of bread on a sheet pan and brush a generous amount of the flavored butter over top each slice. Toast the bread in the oven at 400°F for 10 minutes until golden. Freshly grate lots of parmesan cheese over each toast. 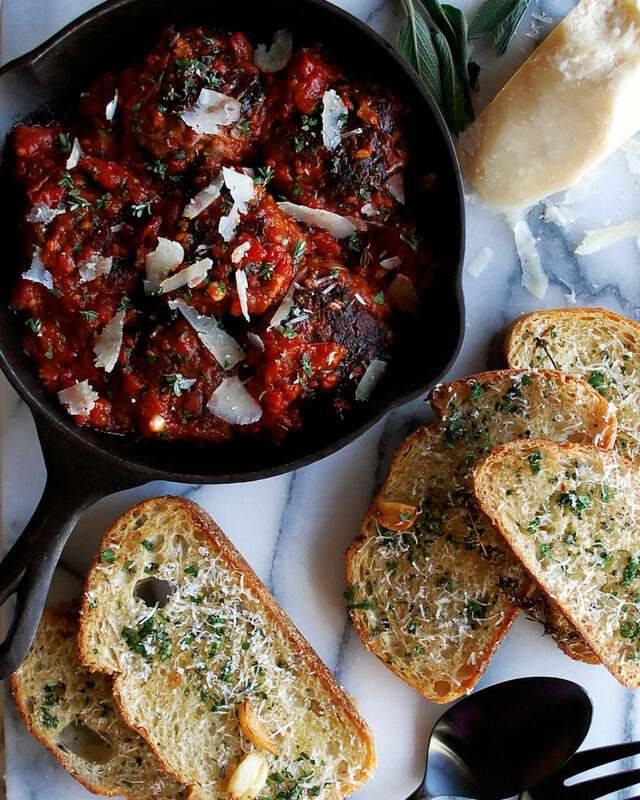 Serve the meatballs with the sauce spooned over top and the garlic bread on the side. Shave parmesan cheese over the meatballs.